Forging a new constellation of ultra-secure communications satellites that will ring the globe to link the president with military forces anywhere on the planet, an Atlas 5 rocket roared to space Friday to continue putting the pieces in place for the warfighter. Counting down to blastoff at 2:42 p.m. EDT (1842 GMT), the million-pound rocket leaped from Cape Canaveral's Complex 41 and thundered eastward carrying the second Advanced Extremely High Frequency satellite, one of the Defense Department's most sophisticated and critical spacecraft. "The primary purpose of the system is so our national command authorities, the senior decision leadership, have the ability to communicate in a nuclear environment," said Dave Madden, director of the Military Satellite Communications Systems Directorate at the Air Force's Space and Missile Systems Center. The heart of that mission is ensuring a survivable line of contact between the president, military commanders and troops on the battlefield even in nightmarish scenarios of nuclear war. "This system will give them the capability to communicate in all environments all the way up through theater nuclear war. That's really what this is all about, so our leadership can have positive control of forces." Valued at $1.7 billion, this satellite becomes the second of a half-dozen to be launched for the creation of a crosslinked constellation of birds that will supply communications to air, sea and ground forces anywhere in the world. Each craft is equipped with stringent anti-jamming features to get vital transmissions to the troops without concern of enemy interference. "There are a lot of threats and jammers out there that can deny our forces communications capability. ...Our enemies know space is critical to our warfighting method. So they are working overboard to deny our communications, to ensure our troops don't get the information they need to effectively operate," said Madden. Getting the 13,567-pound satellite off the ground began with ignition of the launcher's kerosene-fed first stage main engine and lighting the trio of strap-on solid-fueled motors that added a powerful kick in thrust for the 196-foot-tall Atlas. Within three-and-a-half minutes, the rocket had crossed the threshold to space and ejected its bulbous nose cone to reveal the AHEF satellite, folded up into a boxy appearance, just waiting to spread its wings. Once a successful staging occurred, the cryogenic Centaur started its liquid hydrogen and liquid oxygen engine for the first of two burns. The first firing achieved a temporary parking orbit; the second delivered the push needed to deploy the satellite into the pre-planned supersynchronous transfer orbit stretching from 138 statute miles at its lowest point to over 31,200 statute miles at its highest and inclined 20.6 degrees to the equator. The payload separated from the rocket 51 minutes after liftoff while cruising high above the Indian Ocean, in view of the military's Diego Garcia tracking station. Controllers plan to spend the next 100 days or so using the craft's conventional main engine, fed with hydrazine and oxidizer, to execute three large orbit-raising maneuvers, then perform propulsion-with-patience with exotic electric thrusters to circularize the orbit 22,300 miles over the equator for months-long testing. No doubt officials will be anxious when the craft's engine is ignited for the first time given the tumultuous experience with the AEHF 1 satellite in 2010. Following deployment into the same drop-off orbit by an Atlas 5 rocket and facing an identical orbit-raising plan, some obstruction in the AEHF 1's oxidizer plumbing prevented the main engine from firing. After two aborted attempts, engineers were forced to develop a heroic backup strategy to salvage the mission. It took 14 months and over 500 maneuvers, relying heavily on the Hall Current Thrusters firing nearly continuously for vast stretches of time to harness their whisper-like push to propel the satellite to its intended altitude. The miracle recovery plan worked, getting the craft where it needed to be and with enough residual fuel to last its entire life expectancy. Rigorous checks to AEHF 2 and its sister-satellite AHEF 3 have confirmed no such blockage exist in their plumbing. "The original problem, we believe, was caused when rework was accomplished on our propulsion system," said Madden. "Between X-rays and examination and flow tests, we've checked out the propulsion system, both fuel and oxidizer, so we have extremely high confidence problem we will never see this problem again." Read our earlier story on the rescue of AEHF 1. Constructed around Lockheed Martin's A2100 satellite model with a 14-year design life, the AEHF satellites feature power-generating solar panels stretching 89 feet tip-to-tip and two antenna-laden deployable wings. What's more, the craft are nuclear-hardened to survive the effects of hellish warfare and possess built-in autonomy to resolve onboard problems while enduring hostile conditions. They are built to follow the military's aging Milstar satellite series that provide the preeminent communications with top-level protection. While all five Milstars remain in use, the emerging AEHF fleet will fly alongside to offer their faster data speeds and expand the capacity for secure communications across the world. "This system is integral to our national security space architecture. It provides significantly improved protected communications capabilities for both tactical and strategic users. With the addition of a second AEHF satellite in the constellation, the nation will have a robust and resilient seven-satellite combined Milstar-AEHF constellation that will add significant protected communications capabilities for the warfighter," said John Miyamoto, Lockheed Martin's vice president for advanced programs in Global Communications Systems. The satellite constellation's primary purpose is keeping communications flowing between the military and civilian leadership in any extreme wartime environment, which would give the U.S. information superiority. "This system enables (leadership) to set up a voice communications network to ensure we have a positive control of all our weapons and it is critical to our command authority to control forces," said Madden. 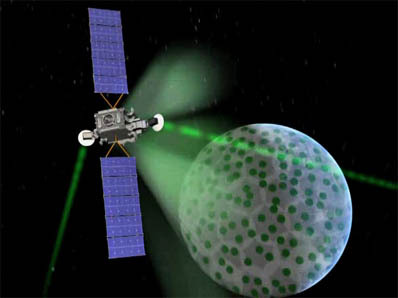 With complex encryption, a low probability of intercept and detection, jammer resistance and the ability to penetrate the electro-magnetic interference caused by nuclear weapons, the AEHF satellites will give the highest protection for communications to the most-critical users. Built in a collaboration with Northrop Grumman, AEHF spacecraft can provide quicker communications simultaneously to more users through modernized technology. Designers say one AEHF spacecraft has more capacity than Milstar's five-satellite constellation combined and its faster data rates will benefit tactical military communications, enabling higher quality maps, targeting data and live video to be transmitted without being detected by the enemy. 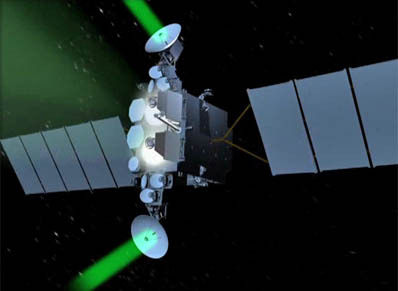 The improved data rates on AEHF vary from 75 bits per second to 8.2 million. In contrast, Milstar's highest rate is 1.5 million bps. "Individual user rates are increased five-fold, providing new capabilities including tactical military communications, real-time video, battlefield maps and targeting data," said Miyamoto. The new satellites will be crosslinked with each other and with the existing Milstars. A key test planned for next year between the first two AEHFs and the associated ground infrastructure will occur before they are formally placed into service. "The Advanced EHF system will be the backbone for protected and reliable and secure communications well into the next decade. Getting SV2 to GEO and operational will be a major milestone enabling DOD's transition from Milstar," said Madden. Communications relayed through AEHF can include critical support to Special Operations, situational awareness for Army troops, giving last-minute targeting information to deployed Air Force fighters and transmitting Tomahawk missile updates to the Navy. For the nation's nuclear forces, these durable satellites would be the communications lifeline for crisis response and war planning in the most dire circumstances imaginable. Although officials won't say exactly where AEHF 2 will be positioned, they acknowledge the craft's coverage footprint will include Europe. "SV2 will build on our longterm cooperative efforts with Canada, the Netherlands and United Kingdom by extending coverage into the European region. This important cooperation enables coalition operations with our key allies, extended interoperability and provides our international partners with an important national capability," said Madden. The nations were early partners on the AEHF program, supplying resources to help bring the new satellite series to fruition. 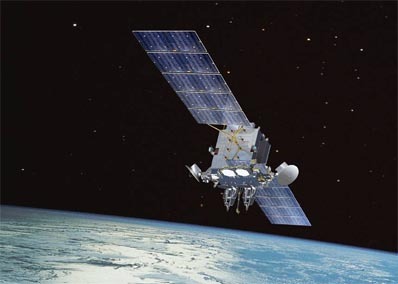 Schedules call for AEHF 3, which has been built and now awaits its opportunity in the packed military launch manifest, to fly in September 2013. AEHF 4 is slated to launch in 2016. The Air Force has received authorization to buy AEHF 5 and 6 together in a bulk deal to save money for launches in 2017 and 2018, respectively. Today's launch marked the 30th for the Atlas 5 rocket over the past decade and the 60th for United Launch Alliance since its formation five years ago. 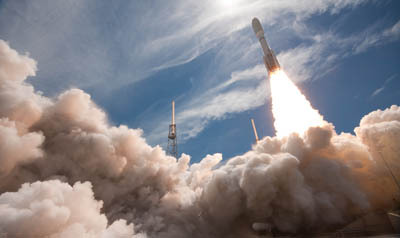 It also marked the third military communications satellite launch this year, following the January flight of a Delta 4 that deployed the latest bird for the Defense Department's high-volume Wideband Global SATCOM craft. An Atlas 5 in February put up the Navy's first satellite in a new mobile communications fleet. Now, today's mission served the nation's secure network. All four of ULA's missions conducted so far this year have supported U.S. national security, hauling up those three new military communications satellites and a radar-imaging surveillance spy satellite aboard pairs of Delta 4 and Atlas 5 rockets. That dedication continues in June when the next Atlas 5 and a Delta 4-Heavy each carry out missions for the National Reconnaissance Office from the Cape.